Searching for Bonobo in Congo » Another look to the North, Diamonds Raze a Reserve. Another look to the North, Diamonds Raze a Reserve. While Ashley was just starting to negotiate the Lomami River to the south of Kisangani, two exploration teams (simlar to Ashley’s teams) finished their two-week inventories in the Rubi Tele Reserve to the north of Kisangani. 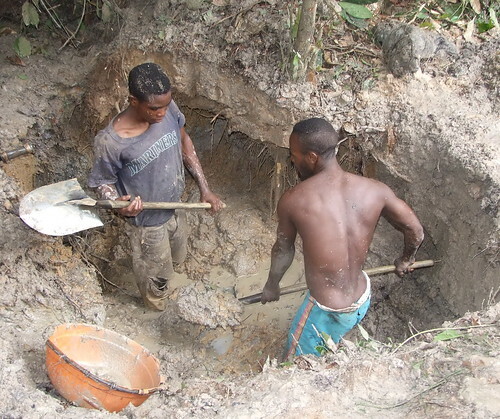 North of Kisangani, in the Rubi Tele Reserve, Dino and his teams found that the wildlife has been plundered to feed the miners on the diamond frontier. More about that below. South of Kisangani, Ashley has found that there are diamond miners. We don’t yet know how far they have gone into the forest or south of Opala. Ashley will find out and post that later. We will work up our data during the next week but already we can tell you that the animals in Rubi Tele Reserve are under threat, particularly on the west side of the road. The good news is that deep in the forest on the east side of the road we still found signs of forest elephant, okapi, forest hogs and chimpanzees. On some of our transects there were even 11-12 chimpanzee nest groups! 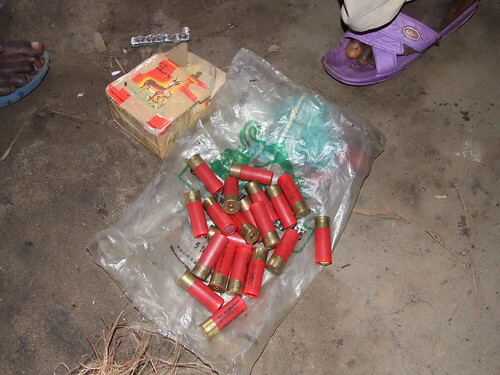 Unfortunately, other monkeys are very threatened everywhere and shotgun shells litter the forest floor. The hunting is heaviest around each of the camps at diamond mining operations. Bows and arrows, spears and various guns including AKs from the rebellion are used. 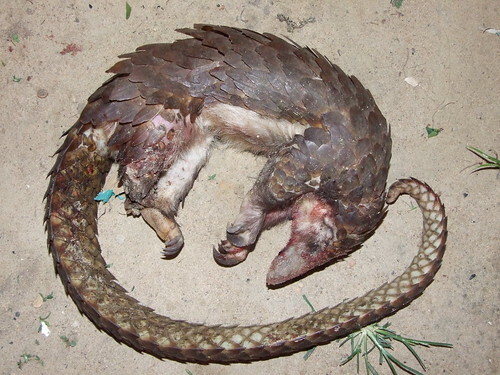 Hunters even go out with lamps and shotguns at night to paralyze their game in the bright light, then shoot them. Now we are looking for gasoline so that the little hotel where we are staying in Buta will be able to run the generator and we can work on our computers to enter data. We will be in touch again very soon. The next update from Dino’s teams will be in one to two weeks. Bon courage, Dino, Kahindo, Crispin and Paka. Good work! In Congo, Diamonds are Whose Best Friend ? This entry was written by Terese Hart, posted on 2007-06-22 at 5:58 pm, filed under Diamonds, gold and guns. Bookmark the permalink. Follow any comments here with the RSS feed for this post. Post a comment or leave a trackback: Trackback URL.